Posted under Health Guides. Updated 14 March 2018. The best way to fight colds and flu is to not get them in the first place! Here are some tips for protecting yourself and preventing the spread of the viruses that cause colds and flu. Get vaccinated! The flu vaccine is a shot or nasal spray that protects your body from getting the flu virus. It’s the best flu protection there is. See your health care provider or ask your parent(s) or guardian(s) about getting the flu shot. Avoid sick people. Though this may be hard, avoiding people who are sick with cold or flu may prevent you from getting infected. Don’t share. Avoid sharing food, utensils, glasses, water bottles, lip balm, and other things that could pass viruses. Wash your hands. Wash your hands with warm water and soap for 15 seconds before you eat and after you cough or sneeze to stop the spread of viruses. Don’t rub your eyes and nose if you haven’t just washed your hands. Sneeze/cough the right way. Sneezing or coughing into your bare hands can spread cold and flu-causing viruses. Sneeze or cough into a tissue or the inside of your elbow to prevent the spread of infection. YOU can help your body fight off infection by boosting your immune system. Being sick with the cold or flu is definitely not fun, so take time to prevent germs from spreading and get the flu shot! What should I do to get better? If you are tired of being sick, you’re not alone. Having a cold or flu is never fun, but there are some things you can do to help yourself feel better. What medicine should I take if I have a cold or flu? There are a lot of different kinds of over-the-counter (OTC) medicines that are sold at pharmacies and grocery stores. Although OTC medicines can’t cure a cold or flu, they can sometimes make you feel better by helping to treat some of your symptoms. It’s important to talk to your health care provider, parent(s), or guardian(s) about your symptoms so they can help you choose the best type of medicine for you. Remember, children under 12 shouldn’t take OTC medicine unless recommended by a health care provider. Tell your health care provider what medicines, herbs, vitamins or other supplements you are taking and if you have any health conditions such as high blood pressure. Know your symptoms and choose the medicine that treats only those symptoms. Read the label on the medicine and follow the directions. Be sure to take the right amount of medicine for your height, weight, and/or age at the right times. For example, some medicine is safe to take more than once a day, while other medicine is meant to be taken only once a day. Know the side effects. The medicine’s label will also list the possible side effects. Some OTC medications cause drowsiness or can’t be taken with other medicine. Do NOT take Aspirin or Aspirin-containing products if you have the flu. There are several different types of OTC medicines (medicine you can buy without a prescription) that can lessen the symptoms of the common cold and the flu; however, check with your health care provider first. Over-the-counter medicine may help to take away symptoms temporarily but there is nothing you can buy that will “cure” your symptoms. If you are taking a medication with more than one ingredient, be careful to avoid taking too much acetaminophen or other drugs. 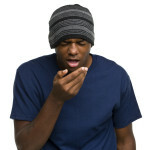 Do antibiotics help treat the common cold? No. Antibiotics are medications prescribed by health care providers to treat infections caused by bacteria. Colds are caused by viruses, not bacteria. Taking an antibiotic will not treat colds. Sometimes people will get a bacterial infection such as sinusitis along with a cold. Never take an antibiotic unless your HCP prescribes it. Is there any treatment for the flu? The best way to prevent getting the flu is to get vaccinated and to stay away from people who are sick with flu symptoms. Anti-viral medicine such as Tamiflu®, Relenza®, and Rapivab® are all prescription treatments than may be prescribed, especially if a person is at risk for serious complications such as asthma or diabetes from the flu. Antiviral medicines work best if taken within the first 2 days of an illness. Tamiflu® is the only pill (oral prescription medicine) that’s used to treat both children and adults who have the flu. Relenza® is a powder that is inhaled and Rapivab® is only given by intravenous (through a vein). It’s important to let your health care provider know if you’re taking other medications, have a chronic disease(s) such as asthma, blood, kidney, liver, heart, or lung disorders, etc. or if you have any allergies. The Center for Disease Control (CDC) recommends that anyone 6 months of age or over should receive the flu vaccine every year, by the end of October. In addition, anyone who has a medical condition that puts them at risk of complications from the flu should make it a high priority to get vaccinated. If you have a chronic health condition such as asthma and become sick with the flu, call your health care provider right away to see if you need to take an antiviral medicine such as Tamiflu®.